I saw a sign advertising its second birthday this week, so I thought I would pop inside to see what “the authentic taste of Italy” offered by Pizza Roma on Bridge Street was all about having never tried it. 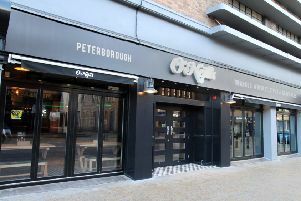 From day one there have been plenty of alternatives - Carluccio’s, Pizza House, Prezzo - and now even more so with some neighbours in Argo lounge and Bill’s. But it can hold its own. Saturday lunchtime it was buzzing - a lot busier than I expected - and we managed to squeeze into the last table for four. The menu is exactly what I expected - a couple of starters, pizza, pasta and a few alternatives. Typical lunchtime fayre, although it does open evenings of course. It is comfortable enough despite being compact, though once you are in, you are in. I fancied something light and went with a pasta dish - Amatriciana. It was very enjoyable without being anything out of the ordinary. A tasty, slightly spicy tomato sauce, lovely bits of Italian bacon and a springling of parmessan quite noticeable. The pizza choice was perhaps not the most adventurist choice on the menu - broccoli e salsiccia - but the vegetable pieces were packed with flavour, likewise the sausage, and the base was just how I like it, thin and crispy with a hint of ‘toast’ taste. It came from the special offer - half and pizza with chips or salad at lunchtime for £5.30. We had the salad which was fresh tasting with a light dressing and delicious olives, although only three. The desserts did look the part and pretty much lived up to it. The chocolate panna cotta was little thick and set for my liking, but still tasted nice and came showered in cream which was lovely. The profiteroles were soft and tasty, with a refreshing ice cream filling, and again covered in cream with a dusting of chocolate. An obligatory Perroni and glass of pino to wash it down and the bill was less than £30 - not bad for a quick and enjoyable lunch treat.